Like many young people trying to earn money while in high school and college, Rob Berkner did his time at a pizza place and a national breakfast restaurant chain, even being offered an assistant manager position at one point. But even then, Rob knew he didn’t want to spend his life working for someone else. The son of self-employed parents, Rob’s dream was to own his own business. He just wasn’t sure what kind of business … yet. 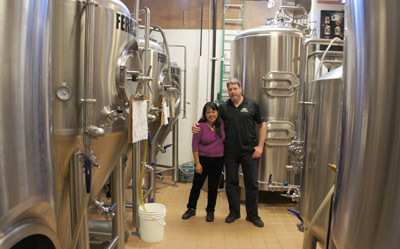 Rob and Candy Berkner stand amidst the giant fermenting tanks in the building just behind their popular Sunnyslope brew pub, North Mountain Brewing Co., which celebrates its third anniversary this month (photo by Teri Carnicelli). Rob met his wife, Candy, while living with a friend in Los Angeles for a short period of time. They moved back to the Phoenix area, where Rob was born and raised, and eventually married and started a family. Rob tried his hand at a couple of different businesses—medical uniform supplies, and custom vinyl signs—and Candy eventually became a registered nurse. All the while, they were both passionate home brewers. Rob came to a point in his sign business where he’d have to commit 100 percent and try to grow it, or move on to something else. At that point, he and Candy decided to draw up a business plan for a small eatery that served small-batch craft beer. Rob’s father agreed to co-sign on a loan. They were already familiar with the Sunnyslope area, as Rob loved to mountain bike in the North Mountains. And in 2010 they bought a property in the heart of the community, at 522 E. Dunlap Ave. But it would be three more years before they could open the doors. Asbestos in the ceiling meant a major remodel, and a new building with high ceilings that could accommodate the large fermenting tanks had to be constructed. In March 2013, North Mountain Brewing Co. finally opened its doors. Rob was able to create some of his own beer recipes, and after much discussion and revisions, the menu was decided to be “beer-centric,” with a sort of “beer foods of the world” focus. On it you’ll find fish and chips, shepherd’s pie, hamburgers, sausage platters, and other foods that are traditionally complimented by beer. Other selections have beer as part of their ingredients. Rob said the original plan was much less ambitious—a kind of sandwich shop with small batches of beer made in the back, and a small storefront. “It was a simple plan; I’m still not sure what happened,” he says with a laugh. It’s a family business for certain. Candy’s mom helps out on occasion, and all three daughters—ages 19, 17 and 11—pitch in as well. If the chefs come up with something that proves popular, the restaurant will bring it back regularly, and it may even make the printed menu. North Mountain Brewing recently revamped its Happy Hour menu (3-6 p.m. Monday through Friday) and added a lunch menu (Thursday-Sunday). And while the beer menu always offers the perennial favorites, such as the cream ale and the James Brown Ale, Rob does like to mix it up on occasion. For example, on March 9, North Mountain Brewing will release its anniversary beer, an imperial brown ale. On March 12 the anniversary party takes place, with food and beer specials all day and live music in the evening. On St. Patrick’s Day, there will be a corned beef and cabbage special and a stout stew. Rob has also concocted a special beer for the occasion, a bock beer—a European lager style but it the tradition of an Irish red. He’s calling it his Erin Go Bock. It was actually made last year and has been aging since then. North Mountain Brewing’s Neurotic—a Belgian blonde ale with a kick—comes out on Good Friday (March 25). But if you are looking for a way to enjoy your favorite beers at home, on March 13, North Mountain is offering “GrowlerFundMe” special, from 9-11 a.m. There will be a half-price brunch menu, but the real special will be 32-ounce growlers available for sale with beers not normally sold in growlers, including the imperial pilsner, stout and brown, a dark Belgian, and the Old Ale. They are all “big beers,” 9.8 percent alcohol or higher. Customers can purchase two of any variety, and a maximum of four mini growlers total, which equals a full gallon of beer. Rob advises showing up early, they will sell out fast. The proceeds will be used to buy another fermenter and maybe a few more kegs so they can build up their beer production. For more information, call 602-861-5999 or visit www.northmountainbrewing.com.